Some key elements of a successful social media campaign are engagement, relevance and uniqueness. Two major brands have adopted that philosophy in their latest Facebook Page campaigns. Clorox Clean Up and Toys R Us are reaching out to moms through charitable programs. Although these companies have traditionally been involved in sponsoring clothing drives and donating to children's programs, particularly around the holidays, this is the first year that they are promoting these activities, and incorporating moms' support, on their Facebook pages. 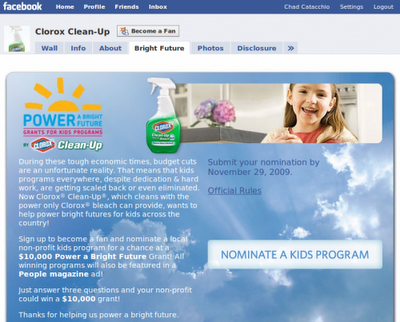 Clorox Clean Up has created an application on their Facebook page where users can nominate a local non-profit program for children. The application, called Bright Future, allows fans to nominate their favorite local non-profit until November 29th. The charities will compete for one of five $10,000 grants and the winning organizations will be featured in People Magazine. 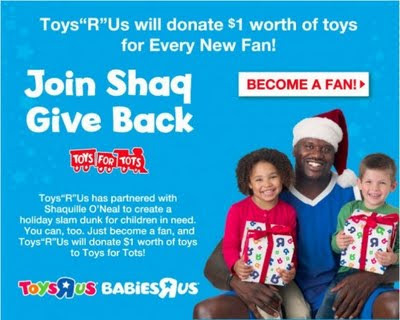 Toys R Us and basketball legend Shaquille O'Neal have been working together on the Toys for Tots holiday drive for several years, and this year, they've expanded the program on Toys R Us' Facebook page. Toys R Us has promised to donate $1 of toys for every new Facebook fan. Once a user becomes a fan, they are encouraged to publish the story to their newsfeed in order encourage friends and family to join the campaign as well. So far, over $25,000 were raised, and Toys R Us' fan count is up to over 350,000. I think these campaigns are a win-win situation: They promote the brand and corporate social responsibility. What do you think? Should companies use charities as a marketing tool? Comment below.